Opens: It was late night opening at the library, and Lucy Picklescott had a whole thirty-five minutes to herself before she was due back for the rest of the afternoon shift. Blurb: Twenty-four-year-old Lucy needs a fresh start. Forever single, frustrated with her studies and dreaming of writing a novel she can’t start, she gives up everything to run home and get a job in a little library in the leafy village of Tilley Moreton. Lucy loves reading books almost as much as she loves fixing other people’s problems, so starting a book club seems like the perfect opportunity to do both. As she meets her new members, it’s clear she’s going to have her work cut out for her. One by one everyone at the book club starts the journey to their happy ever afters – even Lucy. 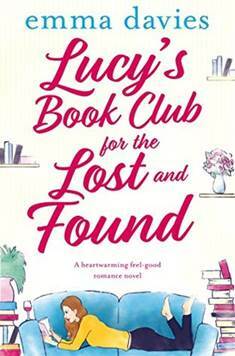 My Thoughts: The subtitle for Lucy’s Book Club for the Lost and Found is ‘a heart-warming feel good romance novel’, and that’s exactly what this book is. Lia, Hattie, Callum and Oscar all turn up at the library to join the book club. Each of the characters take it in turns to tell the story so it is a good way for the readers to know what is going on in each life before the rest of the cast do. Lia is the sole carer for her mother who has Alzheimer’s; Hattie is a single mum whose daughter has just started school and she wants to make friends; Callum wants to make something of his life but his family and lack of confidence is holding him back; while Oscar (who was my favourite character) is a widower missing his wife. Their stories all intertwine as the group becomes friends and each of them hits a low point before realising they don’t have to face this alone, that they have their book club friends to lift them up and help them crawl back out of their pit. Lucy’s Book Club for the Lost and Found is a wonderful feel good story with depth. It covers quite contemporary issues such as caring for the sick and elderly, broken relationships, single parenthood and unemployment. Each of the sub-plots have closure although happy ever after is not necessarily riding off into the sunset. Overall, five strangers become five good friends and I certainly recommend the book, and will read more of Emma Davies’ work. With thanks to Bookouture Publishing and the author via Netgalley for my copy to read and review.